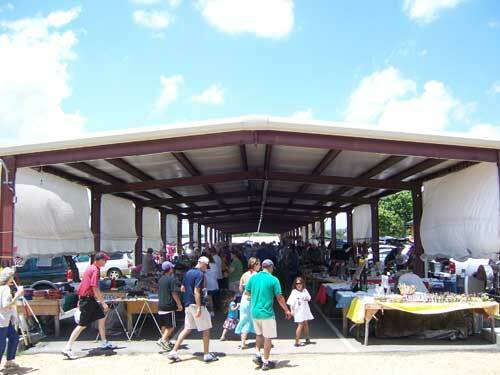 All vendors agree to abide by Flea Market Policies. ** All spaces & tables are assigned by the office personnel. 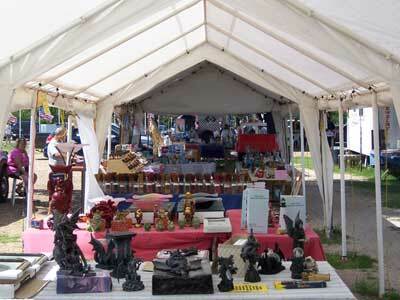 ** Weekend vendors may set up from 9:00 am until dark on Friday. ** Vendors are expected to be open from 8:00 am - 5:00 pm -- the entire business day! ** Paid reservations are held until 9:00 am only! ** All other reservations are held until 7:30 am only! 1. Reservations made by phone or in person are held until 7:00 AM only! Pre-paid reservations are held until 9:00AM only! If you have not notified us, we may re-rent your space(s) if it is unoccupied after this time, no refunds or credits. Please open on time and remain open for the entire business day. No break-downs before 4:00 PM without authorization of MARKET. Failure to comply may result in expulsion from the MARKET. Sellers may not sublet any or all of their space(s). Sellers are liable for all individuals working for them at their space(s) at the MARKET. No “strolling” Sellers allowed. It is required that Sellers display their SELLER PERMIT in the front left windshield at all times. Vehicles without permits are subject to towing. 5 MPH speed limit strictly enforced. No seller/Public admittance into MARKET Mon.-Thurs. without written permission from the MARKET. 2. Fees for your space and additional items must be PAID IN ADVANCE. No partial payments accepted. No checks accepted. NO REFUNDS FOR CANCELLATIONS. After paying you may set up your space during authorized hours only. Additions, (displays, counters, racks, shelves, tables, etc. ), alterations and signs require prior written approval from the MARKET manager. When setting up your space, your merchandise must remain in your space, no obstruct the aisles or adjacent spaces in any manner. No nails, screws, tacks, or permanent fixtures of any type are to be installed in/on MARKET property (tables, posts, walls, signs, etc.). PENALTIES WILL BE CHARGED FOR DAMAGES TO ANY MARKET PROPERTY! No use of electric heaters, coffee pots, or cooking is allowed. All children must be kept under control at your selling area. Failure to adequately supervise children will result in dismissal from the MARKET. NO PETS ALLOWED! 3. Please clean up your space at the end of the day. Seller merchandise, tarps, etc. found in unpaid spaces on Sunday or Monday morning are considered to be abandoned and become MARKET property unless prior arrangements have been made with MARKET office. Do not leave boxes, displays, merchandise, etc., under tables or on the ground during the week. Tarps left hanging at pavilion spaces during the week must be white, in good shape, and the bottom secured at 3 ft. above the ground/floor. PRE-PAYMENTS ARE REQUIRED FOR ALL SELLERS LEAVING MERCHANDISE, DISPLAYS, TARPS, ETC., IN THEIR ASSIGNED SPACES. PRE-PAYMENTS MUST INCLUDE SPACE(S) AND/OR TABLES. PENALTIES WILL APPLY TO ANY UNPAID ITEMS! 4. As an independent business person, you are responsible for all applicable government licensing, etc., including Sales Tax. You should obtain appropriate insurance coverage. The MARKET assumes no responsibility for any accidents, injuries or loss from any cause and Seller agrees to hold MARKET harmless in the event of any loss. Seller agrees to truthfully represent their merchandise to the buyer. You may not sell FOOD ITEMS intended for immediate consumption without prior MARKET manager’s approval. You may not sell TIRES. You may not sell FIREARMS, GUNS OF ANY TYPE, CROSSBOWS, LIVE AMMUNITION, GUN POWDER, or FIREWORKS. You may not sell LIVESTOCK, POULTRY, or DANGEROUS ANIMALS. Pet sales must receive written approval from MARKET manager. You may not sell DRUGS, PARAPHERNALIA, ALCOHOLIC BEVERAGE, ILLEGAL OR OFFENSIVE MATERIALS. Nor may you distribute POLITICAL or RELIGIOUS SOLICITATIONS. Management reserves the right to determine the suitability of any merchandise displayed at the MARKET. 5. The MARKET reserves the right to refuse admission and to discharge anyone, without refund, to or from the MARKET at the sole discretion of management for misconduct or failure to abide by the POLICIES. Penalties will apply to those not following the POLICIES. The MARKET reserves the right to interpret any of these POLICIES or other situations that may arise not covered by the POLICIES at the sole discretion of management. The MARKET assumes no responsibility for accidents, injuries or losses from any cause including but not limited to hurricanes, tornadoes or other acts of God.